In stock -This product will ship today if ordered within the next 9 hours and 21 minutes. 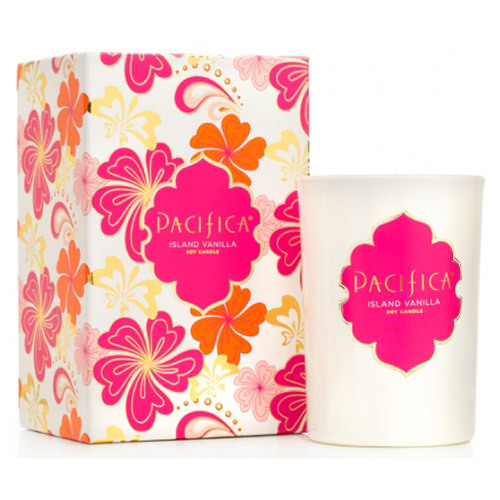 Pacifica Deluxe Edition Soy Candle Island Vanilla - 213g - Each is contained in a beautifully crafted box that is perfect for gifting or keeping and hand-poured in a perfectly white glass that works in any setting. The white milky glass looks amazing in any setting, modern or traditional. Gorgeous packaging that defies all gift wrapping, Pacifica Deluxe Soy Candles are hand-made with the best burning vegetable wax, lead free wicks and our quintessential perfume blends using the highest quality natural ingredients. Pacifica’s Island Vanilla Candle contains a proprietary blend of natural soy wax, vibrant colour, lead-free cotton wicks and Pacifica’s own fragrance blend with natural and essential oils. Below are reviews of Pacifica Deluxe Edition Soy Candle Island Vanilla- 213g by bodykind customers. If you have tried this product we'd love to hear what you think so please leave a review. Pacifica Deluxe Edition Soy Candle Island Vanilla - 213g - These deluxe candles are dye free and hand-made with the best burning vegetable wax, lead free wicks, and our quintessential perfume blends using the highest quality natural ingredients.